During the forty some years that this talented group has been together, King Henry & The Showmen has become the Poconos’ premier show group, and one of the East Coast’s favorite bands. They have recorded over thirty-five albums, and have developed a huge and loyal fan base. 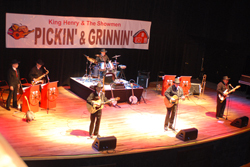 King Henry & The Showmen began their professional careers back in the late 1960’s when they became the house band and opening act at Mount Airy Lodge in the Poconos. For 20 years, they performed there with most of the top stars in the business, including Tony Bennett, The Four Seasons, Al Martino, Jerry Lewis, and Connie Frances. During that time, King Henry & The Showmen were asked to perform in concert in Carnegie Hall. Their sold-out concert there led to appearances in Las Vegas, Atlantic City, and at leading nightclubs around the country. In 1985, King Henry & The Showmen left Mount Airy Lodge and moved to Tamiment Resort, a hotel that was owned by Wayne Newton at that time. 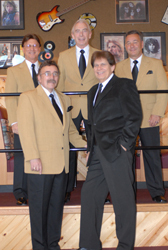 The group performed there nightly until 1991, when they moved to The Mountain Laurel Resort. It was during their years at The Mountain Laurel Resort when King Henry combined with Pocono Day Shows to produce and market a regularly scheduled luncheon show, geared towards motor-coach tour groups. The show, King Henry’s POCONO MOUNTAIN OPRY, became an immediate success. In 1997, King Henry opened his second regularly scheduled luncheon show in the quaint tourist town of Jim Thorpe. For years, Henry presented two different productions in Jim Thorpe at Penn’s Peak, the Poconos premier showplace. Today, King Henry & The Showmen are more popular than ever. Besides starring in luncheon shows, their recent appearances included performances at The West End Fair, The Allentown Fair, Westbury Music Fair, Knoebels Park, and The Atlantic City Hilton. 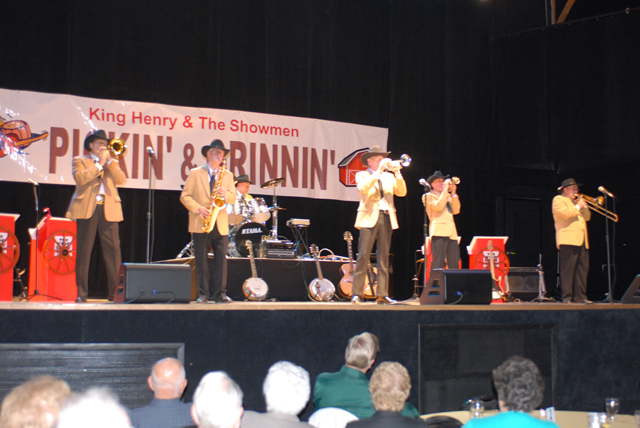 All the members of King Henry & The Showmen are accomplished musicians as well as talented singers and entertainers. Together, they present a unique style of entertainment that can be found nowhere else. King Henry is the leader of the group. He sings, plays many different instruments, and writes the different shows. Gary Dee (DiPasquale) plays guitar and banjo, and is the featured performer in the many comedy routines. Along with Henry, he is also a featured vocalist. The third member from the Lehigh Valley is saxophonist, Frank Russo. Frank is one of the best in the business, having previously performed with popular bands all around the country. John Richetta, the popular radio host of Tempo Italiano, is the drummer with the group. Rounding out the group is Rollin Krause, one of the best trumpet players in the business. Today King Henry & The Showmen are more popular than ever, appearing at concerts, fairs, festivals, nightclubs, and at community events around the region. "More fun then I had in Branson."